Leading Wholesale Supplier of stm water doser and instant pasta steamer from Thane. Water is a precious asset, weaker on our planet aware of this in STM we have always invested resources to optimize its use. 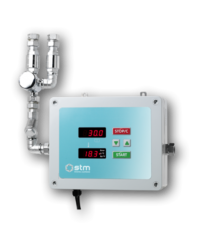 STM offers its entire bakery experience in the bakery sector offering a full range of technological and intuitive equipment, which combines tradition and new baking techniques. STM DOMIX and STM WATER CHILLERS are nowadays indispensable to standardize and optimize the quality of doughs in both industrial and artisanal bakeries, allowing careful and continuous control of quantities and temperatures. 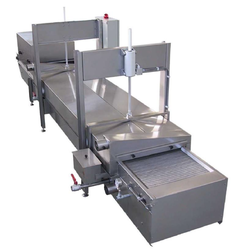 CONSTRUCTION’S FEATURES:- The bearing structure is completely in stainless steel, equipped with adjustable in height small feet.- Stainless steel belt with net with flexible mesh, equipped with lateral chains. Drive pinions in stainless steel.- Insulating cover panel made in a single piece, in stainless steel, in convex form, equipped with high-efficiency internal insulating, sealed with continuous weld between the panels.- Steam production with burner equipped with boiler in the water.- REDUCTION OF 70% ON THE ENERGETIC CONSUMPTION THAN THE TRADITIONAL GAS PASTEURIZER.- Tank for containing water for steam production, length 3000 mm, in stainless steel.- Removable PATENTED system to keep condensation at the exit of the pasteurization chamber.- Water seal for steam, made with a closure system between the upper cover and the underlying tank.- Hoods for humidity extraction in stainless steel with anti-condensation device, equipped with adjustable shutters.- Motor-reducer to drive the belt, with inverter for speed variation.- The machine is made of components and materials of primary European factory, respecting CE norms.